One of the things that we really enjoy doing is hosting parties for friends. When the school year came to a close, we invited hubby's work colleagues to a backyard grill out with a fun summer twist-- tie dying! We decorated with these pretty DIY Tissue Paper Flowers and bulb lights. And got the grill going! Everyone also brought a dish to share. One of Chuck's best friends came over. So, I also prepped a couple of craft activities to occupy the two kids. Ok. Full disclosure here: I'm not a tie-dye master. 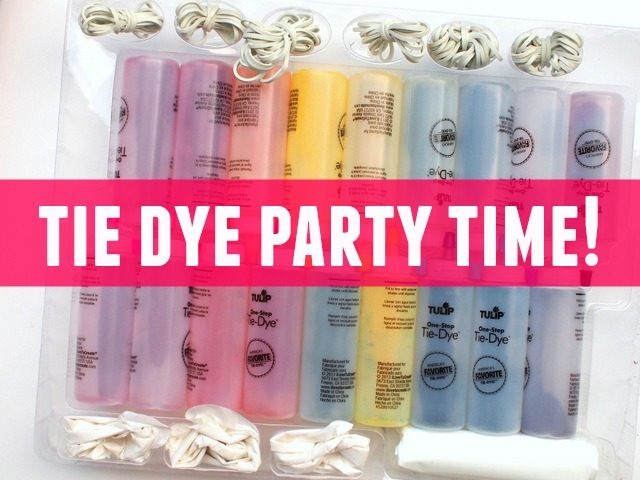 Prior to the party, I only tie-dyed 2 times before. Fortunately for me, the kit contained almost everything we needed. We just had to supply the water, white pre-washed shirts, tubs to dye in, and gallon plastic bags to hold our dyed clothes. That's it! 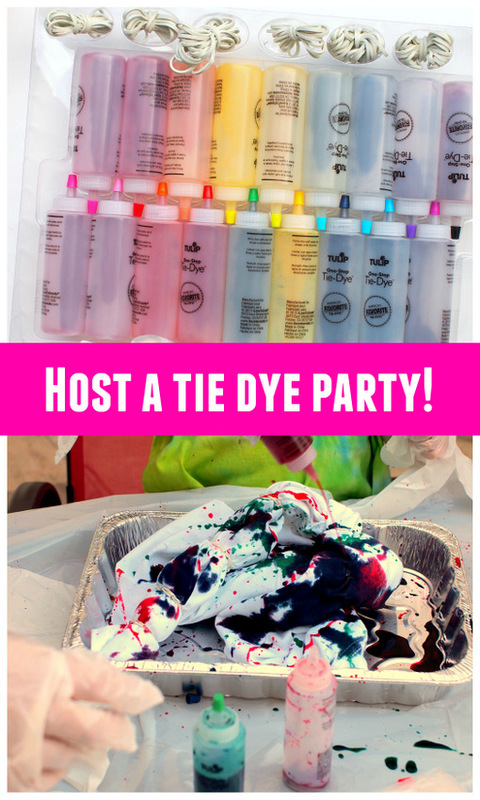 Since it was my first time tie dying with a large group of people, I watched this video showing how to set up a tie dye station. Ok. Back to the party. Of course, the preschoolers were the first to dive into the process. And boy, did they have fun squeezing out the dye! Set up your station beforehand! Cover the table with a plastic disposable table cloth. Prep your shirts with rubber bands. Put out the dying bins. Mix up the dye. Get your plastic gallon bags to hold finished clothes out. Then, call the little ones over. Wear gloves. Seriously. They kept hands from getting dyed! After the kids finished, the adults got to work and they also had a lot of fun. Our parties are typically pretty low-key and simple. However, I always try to provide some sort of craft / activity for the attendees. In my opinion, it really makes the event fun and special! And in case you're wondering, here's how our tie-dyed shirts turned out! Chuck really loves his shirts. I think he feels really proud wearing something that we dyed ourselves. If you'd like to learn more about I Love to Create, you can check out their Facebook, Twitter, Instagram, Pinterest, Tumbler, Google+, or Youtube Accounts! Hope you are having a colorful and creative summer, friends! :) I think your oldest gal will love it!